Dungeness crab continues its comeback in the Bay Area and beyond, after a dismal year in 2015 and less than phenomenal conditions since. Crab season got underway last month with only one small hiccup. Harmful demoic acid levels delayed the start of commercial Dungeness fishing north of Bodega Head State Marine Reserve to the Sonoma/Mendocino county line. But the California Department of Fish and Wildlife ruled everything south of Bodega Head safe and healthy. That has fishermen optimistic about a productive season and local seafood markets celebrating as well. Customers come clamoring for crab in November, December, and January as a favorite way to help ring in the holidays. Dungeness crab fishing is worth $50-$60 million to the local economy, according to the Pacific Coast Federation of Fishermen’s Associations. And according to the San Jose Mercury News, commercial crabbers can expect to harvest 20 to 40 million pounds this season, most of it off Monterey and other Bay Area harbors. 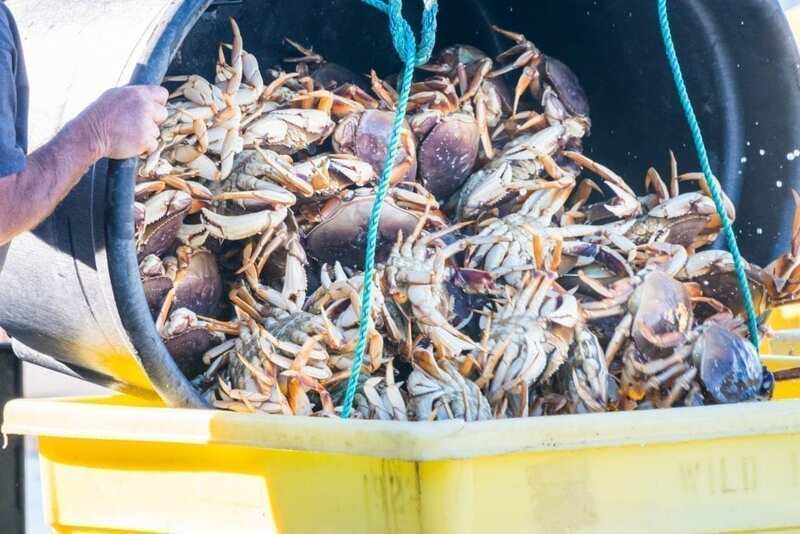 To make sure there are plenty of crabs next year, only males are harvested. Other restrictions include tossing crabs smaller than 61/4 inches wide back into the ocean, and limiting recreational fishermen to 10 crabs each day of the season. Dungeness is wildly popular for a reason. Its salty, clean, sweet, buttery taste is paired with a soft texture that almost melts in your mouth. It can be enjoyed straight out of the shell, with a little butter and lemon, be whipped into a dip, molded into a delectable cake, or tossed into a dozen mouthwatering recipes. Many chefs hail Dungeness crab as the best in the world. You can bet many of your customers do too. Let those shoppers know that industry leaders (and Pucci Foods) recognize California’s crab fishery as progressively designed and collaboratively managed—important for healthy yields far into the future. Sustainability is part of the promise we make to customers no matter what seafood variety they are looking to purchase. In addition to crab, salmon, oysters, halibut, and tuna are also hot holiday buys. For customers feeding extended family who may not have the luxury of living by fresh-caught seafood, these varieties come with bragging rights. Make it easy for shoppers to highlight the incredible bounty of the Bay Area. Offer holiday deals, prepared food, crab already cracked and cleaned, and incentives to take home more than one variety. Recipe cards are also a nice touch that shows customers you care about them long after they make a purchase.